South Africa is presently one of the world’s most exciting Energy markets. A key component of the South African Integrated Energy Plan is the Integrated Resource Plan (IRP), the Department of Energy’s (DoE) 20 year master-plan, which outlines new energy generating capacity from a range of technologies like, renewables, natural gas and nuclear. The 2015 Ministerial Determination allocated 3 126 MW to be generated from Natural Gas. 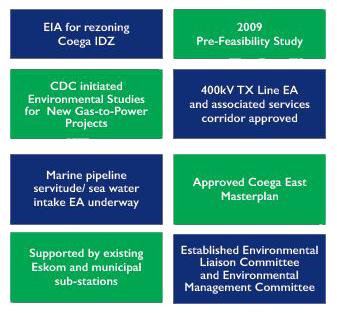 The CDC, and various State organs, including DoE, Eskom and CEF have conducted extensive preliminary work to advance the Readiness of Coega to locate a Gas-to-Power Project. The project entails the generation of over 2 500 MW of electricity, which would satisfy the bulk of the Eastern Cape electricity requirements. As part of CDC’s preparation to locate the LNG facilities and Gas to Power Plant in the Coega SEZ & Port of Ngqura the organisation has identified three sites within the SEZ. These are in close proximity to the Port, sub-stations and services corridor. The CDC has identified various opportunities in the Gas-to-Power value chain. These include the onshore and offshore opportunities that will add value to the economic development. There is advanced industrial capability in the Province as well as in the Coega SEZ; providing an important offtake market for the gas hub. 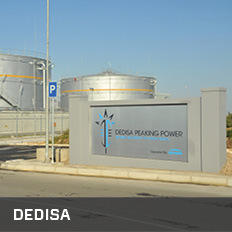 Furthermore, Coega is home to the DEDISA substation, which is vital infrastructure for injecting large amounts of power into the grid. Coega has a mix of wind farm investment projects planned with an overall capacity of 183 MW, a 12 MW Photovoltaic (PV) solar farm, with Bioenergy projects in the pipeline. The Coega Solar Rooftop Project entails the installation of solar solutions on the industrial buildings in the Coega SEZ and Nelson Mandela Bay Logistics Park. A prominent component of the IRP is the requirement for 9 600 MW of new nuclear capacity. Thyspunt, which is 90 km away from the Coega SEZ, has been earmarked as a likely location for the nuclear fleet in South Africa. CDC has identified advanced component manufacturing and localisation opportunities. The CDC leverages innovation and business ecosystems and strategic collaboration – to enhance competitiveness and attractiveness as investor location of choice for Energy projects, while it ensures that it remains relevant to the developmental trajectory of South Africa.